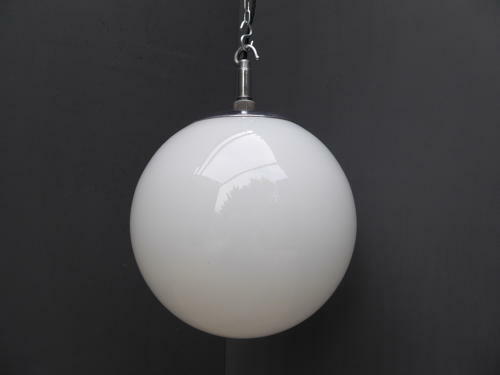 A beautiful original vintage opaline glass pendant light. A simple globe which looks even better lit & is the perfect size for a domestic setting. With original, unrestored chrome 'monks cap' gallery & hanging hook, the wiring in a twisted black flex. ​Wear commensurate with age with some minor expected wear to the gallery, usual chipping to the top rim which is hidden by the gallery, globe exterior in excellent condition. UK courier service available at £12 trackled & signed for 24 hour delivery.